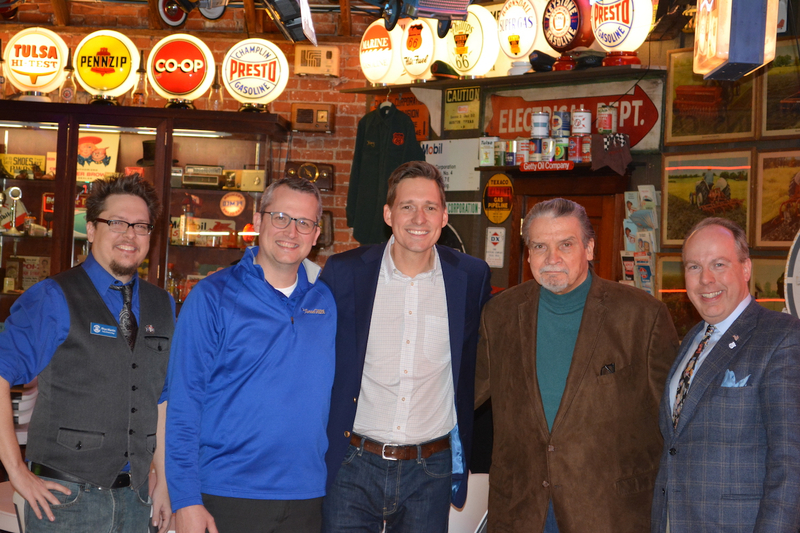 Matt Pinnell’s kickoff party at Signs of the Times on Friday night was a success by anyone’s measure. The Lt. Governor was glad-handing everyone, congenial, smiling and youthful. He had promise written all over his face. He works with State Economic Development and tries to encourage small business and entrepreneurship. At 21, Pinnell was the youngest person in the United States to ever be elected the GOP State Chairman. He is definitely going places. Leon Warner, County Commissioner, Kyle Hilbert, Representative from District 29, Vice Mayor Lou Martin, Jr., and his wife, Don Engle (County Treasurer) and wife, Deana, Dee Dobson (former President of Republican Party of Creek County), Mark Lawson, Representative from District 30, and many other celebrities of the Republican Party, were in attendance. Members of the Oklahoma Route 66 Association and renowned Tulsa author Michael Wallis were there talking up their individual projects. The Association is working to make Route 66 a tourist destination, and working with other entities to make that happen. Wallis is an historian and writer of “Route 66:The Mother Road,” and 19 other books. He told The Sapulpa Times that he was writing a new book, a biography of Belle Starr, the notorious outlaw who lived in Oklahoma for most of her life. Wallis stated, “You’ve got that Frank House down there. I hope it gets saved.” He further said he was always impressed with Sapulpa, the main street ‘s old buildings (Dewey), and had spoken at the Sapulpa Historical Museum when he was on tour for his book on Waite Phillips. Coming Up: The Creek County GOP Breakfast and Convention is happening Saturday Morning. We’ll have an update for you online at sapulpatimes.com and in next week’s print edition.